Convergence (?) of G Measurements - Mysteries Remain. 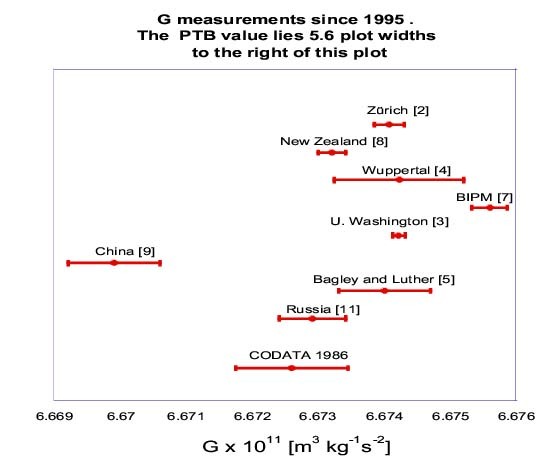 In 1995 the German PTB G measurement group published a startling G value  more than half a percent higher than the previously accepted CODATA value. The figure below indicates the most recent results of groups reporting G values since then. The recently published 33 ppm measurement  by the U. Zürich group is nicely consistent with the 14 ppm measurement by the U. Washington group  and with the 147 ppm measurement by the U. Wuppertal group  and the 105 ppm measurement by Luther and Bagley . These four measurements used very different techniques: The Zürich group measured the weight change of test masses caused by tanks of mercury (this experiment is featured in last November's Physics Today .) The Washington group measured the acceleration of test masses suspended on a rotating platform servoed to match the test mass' acceleration as source masses revolved about the system on a separate platform. The Wuppertal group measured the differential lateral displacement produced by a source mass acting on a pair of separately suspended test masses forming reflecting walls of a microwave cavity. The measurement by Luther and Bagley at LANL used the ``time-of-swing" technique of Luther and Towler's 1982 G measurement on which the 1986 CODATA value was based - but this time deliberately used low-Q fibers to reveal and then correct for the effect of fiber anelasticity. The agreement of these measurements - especially the U. Zürich and U. Washington values - is encouraging, but the figure shows significant outliers. Relative to the U. Washington G value, the BIPM value  is 206 ppm or 4.9 higher , while the most recent New Zealand value  is 152 ppm or 4.6 lower. The value found by Jun Luo and collaborators in China  is also lower, by 647 ppm or 6.1 . The BIPM measurement uses a torsion balance with two substantially independent techniques, sharing the same mass and suspension configuration. One technique balances the gravitational forces on the pendulum with a calibrated electrostatic force. The second technique is that of Cavendish - a measurement of static deflection, with torsion constant calibration from the frequency of free oscillation. The danger posed by fiber anelasticity is virtually eliminated by the first technique (where the fiber does not twist significantly), and highly suppressed in the second by using a thin strip suspension whose restoring torque is largely gravitational in origin. The two methods give results in excellent agreement. Further work on this measurement is in progress. The New Zealand group, like the U. Washington group, used a method in which fiber anelasticity dangers are avoided by mounting a torsion pendulum on a rotating platform servoed to match the pendulum's angular acceleration so that the fiber twist is negligible. The ``time-of-swing" measurement by Jun Luo and collaborators in China minimized fiber anelasticity problems by using a very high Q suspension. Still not ready to report is my own G measurement group at UC Irvine, which uses the ``time-of-swing" method with a cryogenic high-Q torsion pendulum. We are troubled by a timing glitch in some of our early data, temperature control problems in more recent data, and most disturbingly, evidence that the value of G we would obtain may depend on the pendulum's oscillation amplitude. The 1986 CODATA G value became suspect when Kuroda  pointed out that fiber anelasticity would have biased Luther's ``time-of-swing" measurement on which it was based toward a higher G value. The five most recent measurements of G, uppermost in the figure above, all have designs which virtually eliminate anelasticity dangers. Interestingly, the 1986 CODATA value is actually lower than the value reported by all five of these measurements, as well as the PTB measurement. It seems clear that the PTB G value cannot be correct. The PTB measurement balanced gravitational forces against DC electrostatic forces whose calibration involved the measurement of capacitances with 1 KHz AC voltages. A danger which the experimenters recognized is that the capacitances could be frequency dependent, and indeed the BIPM paper  suggests that a grounded lossy dielectric in the fringe field of the capacitive electrodes could cause such dependence. But the PTB workers did check for frequency dependence over a frequency range 100 Hz to 1 KHz and found negligible effect - it would seem surprising if a 0.6% capacitance calibration error that could account for the anomalous G value escaped detection. So mysteries remain, and measured G values have not converged satisfactorily, although the excellent agreement of the Zürich and U. Washington G values is encouraging.